stories in a variety of sub-genres, all with a happily ever after. guitar, singing and of course, reading. middle of town and dropping your line into the river. These aren’t little fish! meal off. I’m getting hungry just thinking about it! The perfect vacation is a jaunt somewhere exotic with my sister. places. Come to think of it, it’s time to start planning our trip for this year. also swim, skate and practice karate. I think I’ve read darn near anything at one point or another! I was in the book store or browsing in the online bookstores. Definitely the James Bond Theme song! 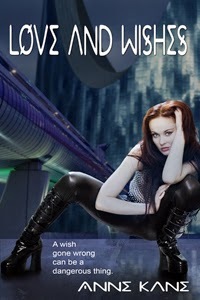 the eve of the biggest Sci-Fi convention in the known universe, she makes a wish. (Okay, I'm bragging — it came from The Author's Secret, which I own, and I was the cover artist for this one).